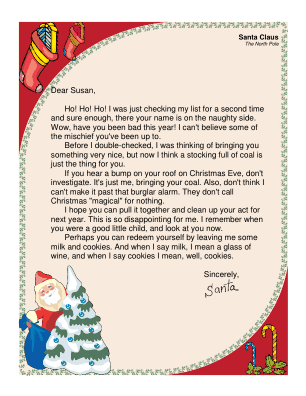 This printable letter from Santa is for adults only! It jokes about the recipient being on the Naughty List and deserving of coal in the stocking. Ho! Ho! Ho! I was just checking my list for a second time and sure enough, there your name is on the naughty side. Wow, have you been bad this year! I can't believe some of the mischief you've been up to. Before I double-checked, I was thinking of bringing you something very nice, but now I think a stocking full of coal is just the thing for you. If you hear a bump on your roof on Christmas Eve, don't investigate. It's just me, bringing your coal. Also, don't think I can't make it past that burglar alarm. They don't call Christmas "magical" for nothing. I hope you can pull it together and clean up your act for next year. This is so disappointing for me. I remember when you were a good little child, and look at you now. Perhaps you can redeem yourself by leaving me some milk and cookies. And when I say milk, I mean a glass of wine, and when I say cookies I mean, well, cookies.